Depression really set in when our last day on Maui arrived. I started to adopt island life and the relaxation it provided, and I was dreading returning to the hustle and bustle of city life. Fred and I definitely had a busy day ahead so we wouldn’t be able to enjoy our last day as much as I would have liked. In fact, we had four more hotels to view. The Marriott Wailea had everything we wanted in a hotel. It was not as opulent, or dare I say "grand", as the Grand Wailea but it definitely had an understated modern style that really suited us as a couple. It had formal elements without feeling too stuffy. The lobby felt comfortable, and the views were magical. The hotel was right on the water so I imagined my guests walking along the beach at sunset. Another pro was its close proximity to The Shops of Wailea, which was within walking distance. This would provide our guests additional amenities such as shopping, dining and other entertainment options. While the group rate was a bit more than other hotels we would view that day, the hotel still became a top contender. This hotel was one of my favorites. It was a boutique hotel, which I tend to prefer over chains. It had such ambiance, style, personality and cool touches, like an amazing ceiling construction and lobby area that I would have loved to take photographs in. It also offered full suites with mini kitchens at a very fair group rate price. Our only problem with this property was its distance from the beach. I loved the idea of our guests being able to step out of their rooms and walk right up to the water. Though the hotel offered shuttles to the beach, The Shops of Wailea and other beach-front Wailea properties, the convenience factor was still a big con. However, we still added this hotel to our top contender list. 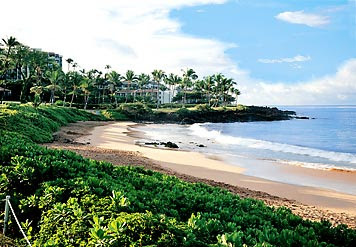 This resort was massive and about a 5-minute drive from Wailea, where our wedding would take place. Though this resort had many amenities potentially available to our guests, I hated the idea of them being confined to the hotel if they did not have a car. The resort was also going through lots of renovations during the time we visited. I will be honest. Everything looked a bit dated to me, which is probably why they were renovating. It was hard to determine what the hotel would look like after renovations were completed so we decided this probably wasn’t a good fit. We wanted to make a sound decision for our guests without any doubt. This hotel did not make our top contender list. This hotel was also about 10 minutes from Wailea in Kihei, the area we stayed in. However it offered the most reasonable price for our guests. It was a nice hotel but it did not offer nearly as many amenities as the others we saw. This also did not have the appeal of the hotels in Wailea. I think ambiance and location played a big role in this. The rooms were very nice, updated and comfortable but this was more of a hotel I would stay in on a business trip, instead of a dream Hawaiian vacation. Sadly, the Maui Coast Hotel did not make our top contender list. Fred edited all of the videos he shot with his flip cam of each of the hotels. We shared all of them with our family and allowed them to vote for their favorite. Now we are sharing our top contender videos with you! Which hotel would you have picked for your guests? Let me know! I will share our final pick next time. Dellables Design Team of Tamera Sandvold and Della did a fantastic job of decorating one of our favorite venues here on Maui, Mala's at Wailea in the Marriott Resort. Della and Team Dellables had MORE FUN than a vendor should have this wonderful wedding event. This wedding was so much FUN and so creative! Thanks Tracy and the crew at A Dream Wedding Maui Style! 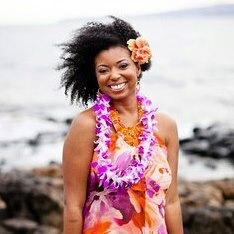 Jessica and Ryan traveled to the warm shores of Maui for their dream wedding at the Wailea Marriott on May 6, 2011. Tracy Flanagan of A Dream Wedding Maui Style handled all of the beautiful details of their wedding day including minister Paul Tangonan, amazing florals by Dellables and photography by Peter Thompson. The happy couple was married at the Kahoolawe Lawn under a rectangular bamboo arch with fresh florals attached and a petal pathway of lavender and white rose petals to match the purple theme of their wedding. Harpist Ginny Morgan provided the beautiful music for their day. After their ceremony the couple spent some time on the beach for a few romantic shots before they headed off to dinner. Their reception dinner was decorated with fantastic floral accents provided by Dellables, we just loved the romantic look of all of the details! The couple’s celebration continued at Mala Restaurant in the private Buddha Room with their family and friends. It was a wonderful night and we had so much fun planning the big day! We are so honored to have been a part of the celebration, congratulation to Jessica & Ryan from A Dream Wedding Maui Style! Just finished up a beautiful afternoon at the Wailea Marriott Maui resort. What a day it was! Whales jumping, sunny ocean reflections and typical perfect temperature. The Bride and Groom brought 80 of their friends and family from Canada and the place was hopping! They enjoyed a beautiful Wedding Arch from Dellables with three floral arrangements (which they then used afterward as table arrangements!) flowing fabric as well as table decor such as submerged cymbidium orchids in towering vases. Tracy Flanagan of A Dream Wedding Maui Style was there as well as Cindy Pestana of the Marriott. And, we must admit, the sunset was probably one of the best we have seen in months!